Let the countdown begin! Less than two weeks to go till the all- day Frighten Brighton horror film extravaganza at the Komedia! 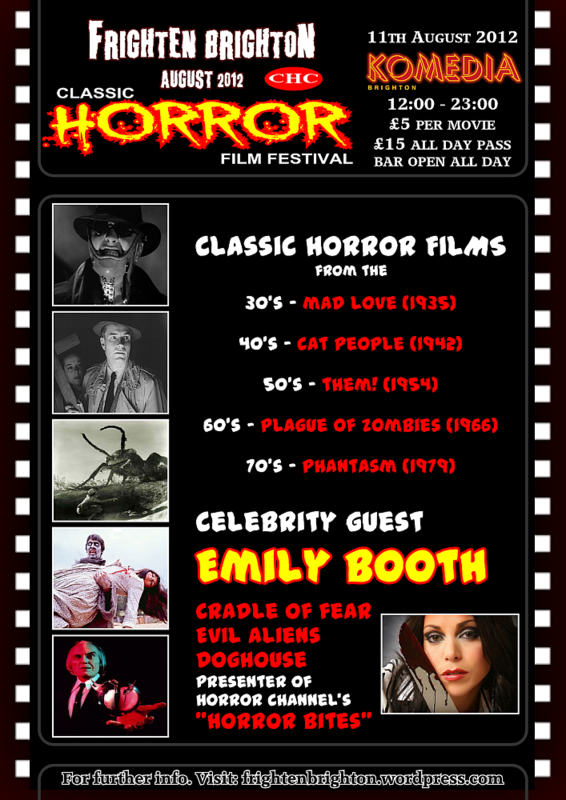 It seems that the whole horror community is already buzzing about the FRIGHTEN BRIGHTON CLASSIC HORROR FILM FESTIVAL which takes place on Saturday 11th August 2012 from 12 noon! Join your horror hosts CYBERSCHIZOID and SCARE SARAH along with special guest star EMILY BOOTHand sponsors HEMLOCK BOOKSfor a whole day celebrating classic horror films through the decades from the 1930’s to the 1970’s at The Komedia, Brighton’s premier entertainment venue. THE THOUGHTS OF CHAIMAN WEEG BLOG : “The British Cannes of Horror”. This entry was posted on July 29, 2012 at 7:45 pm	and is filed under Uncategorized. You can follow any responses to this entry through the RSS 2.0 feed. You can leave a response, or trackback from your own site.